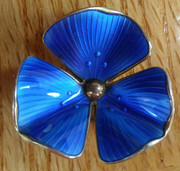 Does anyone know the maker of this Norwegian enamel on silver brooch? I thought it might be Ole Olberg, but the mark does not quite match as the four dots in the mark are raised. i believe is it Ivar Holth.